Dragons of Tarkir marks the culmination of the Tarkir story-line and a block that is likely to be remember fondly for providing one of the better limited environments and one of the very best Standard seasons in recent memory. As this point of the year we are very close to having our Standard decks for the season reach the apex of their potential power, with just Magic: Origins now unreleased and nearly 2000 cards at our disposal. However, despite some very tasty early reveals, the financial future of Dragons of Tarkir is pretty hazy as we look forward at the rest of 2015. As pointed out by Saffron Olive in his excellent article on the Estimated Value (EV) of the set, the current value of a box is well below the average set value of the last few years, and certainly not worth cracking packs of at present. This is especially concerning because we haven’t even made it to release weekend yet, and normally at this point the hype around a new set is strong enough to drive prices up to a temporary high that lasts a couple of weeks. 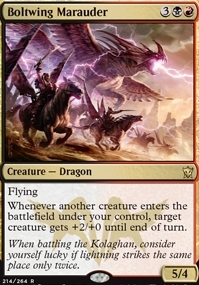 This is not the case with Dragons of Tarkir, and it leaves us wondering, what’s up with this set? When digging for dollars with DTK, we have to ask ourselves whether the combined wisdom of the player base is having trouble identifying the currently undervalued cards hiding in the shadows, or whether we’re simply dealing with Dragon’s Maze 2.0, a set notorious for it’s ongoing lack of valuable cards. This combination means that the set is largely lacking in major standouts for short-term gains and also that many of my picks will only have 18 months in Standard to find homes before they hit the bulk bins for years. Now on the plus side, the ever-shifting 2015 Standard metagame leaves a lot of room for price spikes on select cards whose decks find sudden success in high profile Top 8’s. The low EV of the set, much of which lies in the lacking mythic rares, also leaves the door wide open for some rares to hit the $10-12+ range. All of that being said, I think there are some cards here worth picking out. Remember however, that you’re really going to see the greatest returns if you skip the armchair theorizing and buckle down to test the decks ahead of the curve. It’s also worth noting that summer often represents annual lows for Standard staples, so you really need to believe your deck is going to have a shot at taking off within the next few months to justify not waiting until the release of Modern Masters (2015) to dive in. Frankly, this dragon lord is being overlooked and underestimated. The funny thing is that it’s actually the new control tools on offer at common and uncommon that seem to make his inclusion in an U/W or Esper Control strategy a very likely event. Cards like Anticipate, Silkwrap, Banishing Light, Ultimate Price, Hero’s Downfall, Dig Through Time, Negate, and Treasure Cruise all help a deck using Ojutai to kill the opponent a real thing. 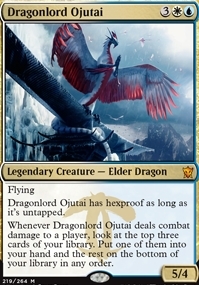 Ojutai only costs 5, which is low enough for him to be a 4-of in a control deck that doesn’t feel like waiting around. This is a very nice casting cost for a potentially game ending threat that allows control to cast him early and rely on his hexproof to hold down the fort, or to use some of their new 2-mana counters or kill spells to back him up a bit later in the game. Heck, he loves it when you cast Crux of Fate and he plays very nicely with Silumgar’s Scorn, which is also much better than you think. 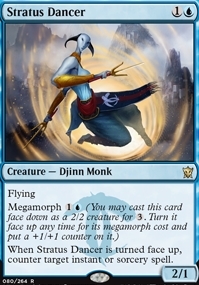 The fact that connecting with him lets you cast a free Anticipate (the best blue card in the set) is just gravy. Here’s a card I intend to go deep on, because I actually think this guy could be Modern playable at some point. Silver bullet strategies have been extremely powerful in the past, and there is a mountain of potential graveyard synergy to fuel his actions. Think Kitchen Finks. Remember, Diabolic Tutor type effects typically cost four mana, so we’re basically getting a 4/6 Deathtouch for one that just happens to block and kill Siege Rhino, Monastery Mentor, Goblin Rabblemaster, Surrak, Hunt Caller, etc. 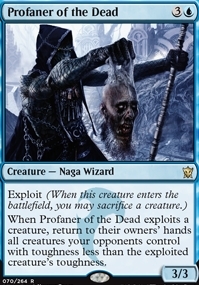 That body is stapled to the ability to sacrifice a creature we want in the graveyard anyway (Deathmist Raptor), or which has overstayed it’s welcome (Satyr Wayfinder), and then go get whatever answer we need to our opponent’s most pressing threat. Being able to choose between Thoughtseize, Ultimate Price, Hero’s Downfall or Dromoka’s Charm is no joke. Ultimately, I think the zombie snake is a 2-3 of, but that might be enough to earn a spike if someone figures out how to optimize his usage. Mono-red aggro now has all of the tools they could ever want to take advantage of control decks and new durdly decks that spend too much time fooling around with their new toys to drive home the killing blow. 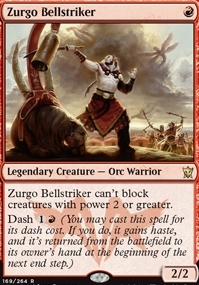 Make no mistake, despite his embarrassing new role in Tarkir society, Zurgo is one of the best red creatures in the format and highly likely to hit top tables in the first wave of new Standard decks debuting later this month. If the deck puts up consistent results, this card should hit $4-5 easily, and post-rotation this fall the deck should still be in great shape and set up to do even better during this weakest Standard field of the year. If mono-red ends up being a beating, the mono-blue devotion we’re all trying to resurrect gets that much better because Master of Waves is an absolute coffin nail against red. Brad Nelson and Todd Anderson posted a five-game match to Star City Games this week, and it showed pretty clearly that while blue devotion might not be what it was, it’s still a real deck. This card is not the 2-drop that blue devotion wants, but it is the 2-drop that they’re going to need. As an early evasive threat that can counter instants or sorceries starting on turn 4, Status Walker is also playable in other tempo oriented strategies and will often be a 4-of when it’s being played at all. As such there is some slight upside to be had if you can prove out his value in your testing regiment and get in on some copies before anyone else notices how good this card is. In the not so distant future, Polukranos is going to rotate out of Standard, and people are going to realize that a similarly costed beatstick with haste is a pretty good way to get your game on. Green just so happens to be the strongest color in Standard right now, and that’s likely to last until at least the fall. 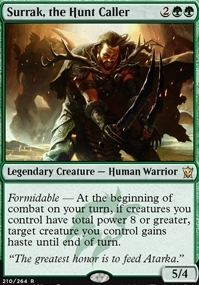 In the meantime, plenty of people are brewing up R/G, Mono-Green and Temur builds that include this guy as a 2-3 of. Don’t be put off by his Legendary status. After all, Polukranos has already amply demonstrated that the first copy of a must-answer threat either dies to removal and frees up the second copy immediately, or it doesn’t die and you are clearly winning with a backup in hand. If some key pros (think Brian Kibler) end up making this work and get somewhere at Pro Tour DTK, expect this card to double in price on the spot. This guy basically dies to everything, right? Well, not quite. See, in the mono-black and B/W warrior builds they’ve usually run out of removal by the time you’re this far up the curve, and if your aggro deck gets hit with a sweeper, that’s just something you live with. The rest of the time, this guy starts doing a Gray Merchant of Asphodel impression once you get stalled out on the ground, and buys you time to finish things off. These decks were already Tier 2 prior to this set and now have additional options including Blood-Chin Rager (Falter effect), Pitiless Horde (Lava Axe), Ultimate Price/Silkwrap (Cheap Kill) and Arashin Foremost (Portable Beating and another target to double up from $1.50 to $4). It’s entirely possible that we see one of these builds claim a Top 8 slot before summer in which case, this card could easily triple up. Otherwise this slides into bulk oblivion in a hurry. 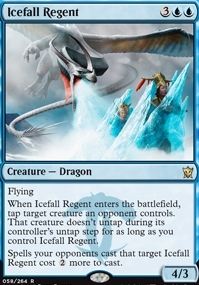 So, the future of this card and it’s effect on your wallet lies almost entirely on whether the Dragon Tempest/Descent of the Dragons combo manages to find a home in a Tier 1 deck before the end of the year. To live the dream you play some small creatures like Battlefield Thaumaturge, Sylvan Caryatid or Dragon Fodder/Hordling Outburst that are tough to kill reliably before Turn 5. You then cast both Tempest and Descent on the same turn, turn 3 creatures into 4/4 dragons with haste, they deal nine to your opponent directly, and then attack for 12. That’s 21 as early as turn 4 or 5. Hour of Need can provide a backup combo plan. Your deck can be built U/R (for consistency) or U/R/G (to support Caryatid and possibly Sarkhan) and can easily work a transformational sideboard, swapping out the combo for a mid-range game plan with Thunderbreak Regent and Stormbreath Dragon. This is a reasonably costed evasive threat that can attack for 11 when you cast Hordling Outburst and can’t be killed by Silkwrap or Ultimate Price. Dragon Fodder and Secure the Wastes are also real cards. Hornet Queen gives it (or something else) +10! 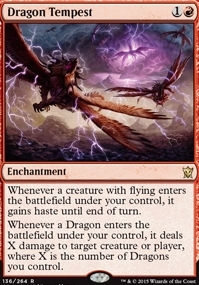 The Boltwing is also worth a mere 2 quarters at present, likely because it’s totally overshadowed by flashier dragons. I’m picking up a few sets, just in case someone puts this to work. This is part Dungeon Geists, part Frost Titan and both of those cards made top tables in Standard in seasons past. It’s also a very plausible top of curve if mono-blue devotion, U/R dragons or another blue mid-range strategy takes off. 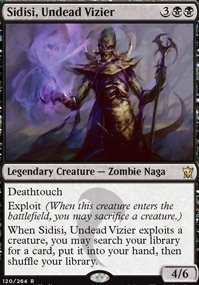 It turns Silumgar’s Scorn into straight up Counterspell alongside Ojutai. The rate is good enough on this card that it can easily triple if you see this on camera at some point. A lot of people are completely missing that in Standard this card is going to bounce 75-100% of the opposing army against decks like GW Aggro, Mono Red, Mono Blue, G/W Devotion, Warriors even when it has to exploit itself. If you’re in some weird Sultai build this can even stay on board while you ditch something tasty to whip back the following turn. Whipping the Profaner back is still pretty ugly. 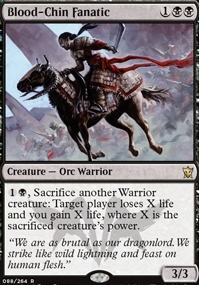 This also has a future in EDH/Commander where you can bounce untold creatures while mining value from something big you wanted to die for value. At $0.50 this is already near it’s lowest possible price, and I’m in for 20 copies right off the bat. It wasn’t so long ago that we got a 3/2 for GG and called it playable. These days we’re getting reach, trample and the ability to grow very quickly in the presence of +1/+1 counters and most of us are yawning. Let me be clear. This card is definitely playable, possibly even in Modern. Living the dream with this card is a deck that can field a couple of counter based creatures on turns 1 and 2 and play this as a 5/4 on Turn 3. A 4/3 on turn 2 could beat Tarmogoyf a lot of the time. I’ve been testing a counters based Modern deck for a while, and it will love this card, falling into the ranks along with Bloodhall Ooze, Young Wolf, Scavenging Ooze, Experiment One, Strangleroot Geist, Lotleth Troll and Predator Ooze. The deck is nowhere near Tier 1 but eventually the bell will get rung on critical mass of good counter synergy based low drops will get hit and this card will see play. My top picks from the above list are Ojutai, Sidisi and Zurgo in that order. Everything else is a true long shot. Narset is over-priced even at $20 and Sarkhan is 50/50 to drop to $10-15. Sell into hype. Several cards in this set are over-priced already if they don’t find a home in a big deck in a hurry. These short-sell targets include: Shorecrasher Elemental, Ojutai Exemplars, Deathmist Raptor, Descent of the Dragons and Dragon Whisperer. So there you have it, the long-shot specs of Dragons of Tarkir. Which ones are you going after and why? Anything I missed that you think has a shot at a big rise? From this list, Humble Defector, Frontier Siege, Yasova, Tasigur and Torrent Elemental all saw high level tournament play in the last few months. Tasigur and Frontier Siege might have even made you some money. I went pretty deep on Tasigur at $2, and that has easily paid for some of the specs here that were stillborn. Not bad at all given the time-frame but still proof that buying the full portfolio of long-shot lists like this is a bad strategy. You really need to figure out which of the options is the next Tasigur and load up, which is much harder than it sounds. IMHO Cloudform needs time to find a Modern or Legacy deck. Dark Deal and Soulflayer are already seeing play, but their foils haven’t really taken off yet. Reality Shift is a consensus terrible card so far. Wildcall was utterly overshadowed by the success of Master of the Unseen/Whisperwood Elemental as the definitive manifest cards in Standard. I was intrigued by Surrak, the Hunt-Caller, but I shrank back when the card was announced in the Event Deck. Will inclusion in the Event Deck hurt the card’s value? If so, how much, and if not, why not? I am completely blown away by Avatar of the Resolute. 4/3 trample and reach on turn 2 just by having a simple creature like Servant of the Scale in play on turn one. And the ability to grow even more is just a win. Somehow it feels like people haven’t realised how strong that is. Reach may be useful in a specific metagame, but trample on this creature is just going to win games. There will be no chump blocking this. It doesn’t get more aggro than this. I really enjoyed reading this post. Informative and to the point. I totally agree with your picks. Thank you for your effort! I totally overlooked Profaner of the Dead and can get 20 copies right now for 0,19€ each. I think, I might just do that, because the investment is really low and it could pay out quite well. Thanks! (If it doesn’t, I’m not mad, as I think, I can sell the playsets for at least a little value). 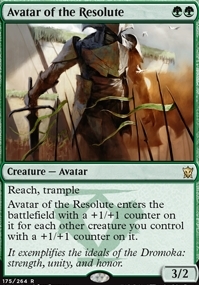 I really like avatar of the resolute. For how long was tarmogoyf bulk before it sprouted wings (at least a few months if I remember)? I also like Ojutai. UW is rarely so full-bodied. Also, you allude to shorting cards. I took that to be a figure of speech, but do you see any real possibility to do that? the return policies of most mtg retailers would allow it… maybe once per… As an aside, does anyone ever oversee, in any commodity, a “long short”, i.e. a long-term short sale? Shorting cards is not a practical option, but many of us wish it were. Avatar having lower toughness than power leaves it fairly exposed to bolt in Modern. It also warps decks in a counter specific direction in a way that Tarmogoyf does not, so they aren’t on the same level, but it’s still a card with high potential assuming future synergies. Deathmist Raptor is NOT overvalued currently at $14-$15. If you look at other cards that have effects that return themselves without paying a mana cost (Vengevine, Bloodghast, etc) They are decent prices. Vengevine is similar where you have to pay mana to play two creatures in order to bring him out. There is a Mono-Green Devotion deck that has been keeping low key using this card and I think the raptor’s price will not change much. It might drop a bit in the beginning of the set, but that’s about it.